IITA scientists, in collaboration with national partner institutes and development partners, are gathering to define which agronomic practices could narrow the cassava yield gap and how these can be scaled up to many farmers in Nigeria, Tanzania, Ghana, and Uganda in a new initiative, African Cassava Agronomy Initiative (ACAI). This is planned to commence in 2016. ACAI aims to take cassava to scale in cassava-based systems in sub-Saharan Africa. Upon implementation, ACAI will be driven mainly by implementing partners and focus on the agronomy requirements of cassava fields and integrating best practices for other management objectives. According to FAO figures in 2011, Africa produces more cassava than any other crop. More land is cultivated to the crop but the yields are low, with current estimates ranging between 8 and 15 t/ha against an achievable yield of more than 30 t/ha. Dr Bernard Vanlauwe (right) talks about the ACAI project to partners. 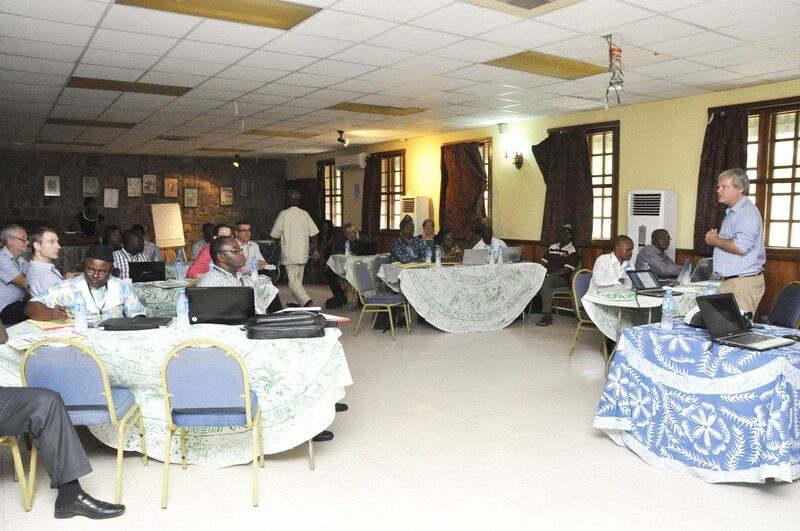 “Agronomy includes many things,” Dr Bernard Vanlauwe, IITA Director for Central Africa, said during the Cassava Agronomy Stakeholders’ Meeting on 28 April-1 May in Ibadan. “In this initiative, we are asking development partners that are engaged in cassava value chain activities to tell us which agronomy information they would need to improve their work; that’s what ACAI will work on. Dr Vanlauwe, in one of the first studies to examine the potential of combining inorganic fertilizer and good agronomy practices on cassava fields in DR Congo, found that the combination could give high yields while also allowing farmers to cultivate cassava with other crops, such as nutritious beans and soybean, on the same plot and at the same time. “The results from Uganda and DR Congo show that by training farmers to know the specific needs of the cassava variety on their farm lands and also to diagnose nutrient requirements properly on their fields, farmers can have much better harvests,” said Dr Vanlauwe. Developing geo-spatial recommendations to close yield gaps; and Integrating national systems and engaging them in innovative cassava agronomy aimed at reaching scale. ACAI intends to partner with the International Plant Nutrition Institute, the International Fertilizer Development Center, the International Centre for Tropical Agriculture, Center for Agriculture and Biosciences International, Federal University of Agriculture Abeokuta, National Root Crops Research Institute, Tanzania Agricultural Research Institute, SG2000, 2Scale-Psaltry, CAVA-II, Farm Concern International, Minjingu Fertilizer Company, Notore, and many others.